Rather than guessing, we can use some stats to work out the probability that a drop in sales is just a random fluctuation. The Poisson distribution gives us the probability of a given number of discrete events occurring in a fixed interval of time (or space), if these events occur with a known average rate and independently of each other. It can be used to investigate the accuracy of v1 flying bombs, the number of 19th century Prussian soldiers kicked to death by horses and the number of South Africans attacked by sharks. It can also be used to calculate the probability of getting <= n sales per day/week/month, if we average N sales per day/week/month. 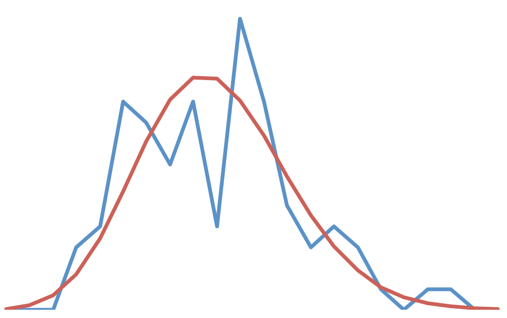 A comparison between the number of PerfectTablePlan sales per day over 90 days (blue histogram) vs predicted by the Poisson distribution (red histogram). We would expect the prediction to become more accurate with more data, assuming nothing else changes. Obviously things do change over the lifetime of a software product, hence the relatively short time span chosen. If we average 5 sales per week, the chance of a 40% or more drop in sales (i.e. a week with 3 or less sales) is 26.5%. If we average 50 sales per week, the chance of a 40% or more drop in sales (i.e. a week with 30 or less sales) is 0.2%. So the less sales we make (or the shorter the period we look at), the bigger the random fluctuations we can expect. If I was averaging 5 sales per week, I wouldn’t be too worried about a drop of 40% in sales for one week. In fact, I would expect it to happen approximately one week in every 4 (running a business that averages 5 big B2B sales a year, must be very stressful!). But if I was making 50 sales per week, a 40% drop in sales should only happen by chance approximately once every 10 years. I would definitely check for other causes. Assuming it isn’t just a statistical blip, the most likely cause of non-random change is an issue with your website. Rather than waiting for a problem, I suggest you set up continuous monitoring that emails or SMSs you if a problem occurs. There are various services for this. I use free pingdom.com and siteuptime.com accounts. Using 2 different services protects you against one of them silently failing. If your website is up, what else have you changed recently? 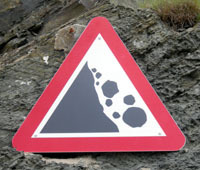 Check your analytics for changes and your Google webmaster tools account for warnings. Has traffic dropped (perhaps you been slapped by Google)? Has the number of downloads/trials dropped while the traffic stayed the same (perhaps there is a problem with downloading/signing up)? If you have made a new release, double check there are no major bugs in the installer or software. “It works on my development machine” doesn’t cut it with customers, so check it on a non-development machine or a clean VM. Don’t assume that random strangers on the Internet will email you to tell you that something is broken. Perhaps 1 in a hundred or a thousand will. The rest will just click the back button. You can improve your odds by having loyal and engaged customers and a clearly displayed email address and/or phone number. But still don’t depend on it. When is the last time you noticed an issue on a website and took the time to report it? Also some seasonal variation in sales is likely. The pattern depends on your market. Many businesses see a drop in sales in the northern hemisphere summer. But my wedding table plan software sells better in the summer. Hopefully you will know the pattern for your product after a year or two. Random fluctuations and the lack of visitors to report issues means that it is hardest to tell whether a drop in sales is real when you start out. This is when you need the sales most, both financially and emotionally. It gets easier as your traffic and sales improves. No one said that life was fair. This entry was posted in article, marketing, microISV, software and tagged cause, fluctuation, poisson distribution, random, sales, software, statistics on 11 May 2014 by Andy Brice.